I have collected a LOT of links. I'll post more of them here soon. 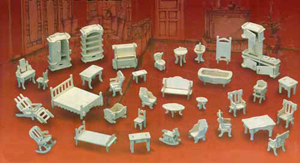 This is the punch-out furniture I used for Faith's Dollhouse. You will need more sandpaper since the kit only supplies a miniscule piece. You will also need glue - PVA is fine. The set is cheap, but the downside is that some of the pieces are die cut crooked. My husband watched me digging away on some of the pieces with my Exacto knife and bought me a Dremel hobby tool part of the way into making the furniture, and WOW, what a huge difference, but so much for this project being on a budget! Thanks to my Sweetie for caring enough to notice. I'm sure I'll use my new Dremel 7700 for years to come - I'm loving it. I found this You Tube video by Cheryl. She has used this same DIY furniture AND the house you can buy to match. I love the way she's upholstered the living room pieces. It might be wise to browse the name "Woodcraft Construction Kit" to find the best deal on the Internet since I have seen it listed for at least four different prices. There is also a house you can buy that matches this furniture. I also used rectangular tiles to make the surrounds at the top of my staircases. Queen Mary's Dollhouse is a doll's house built in the early 1920s, completed in 1924, for Queen Mary, the wife of King George V. I include this link simply because it's amazing.